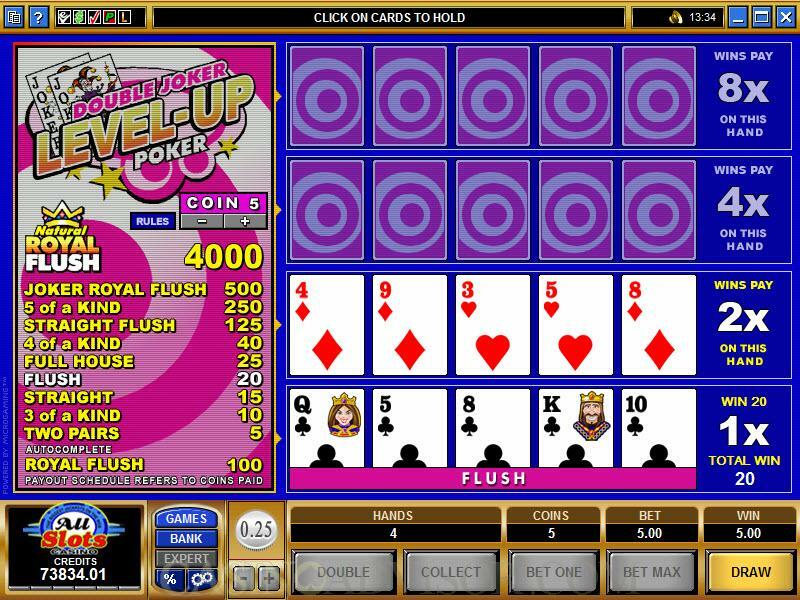 Double Joker Level Up Poker is the fifth video poker game in Microgaming’s Level Up Series. In this game the player plays four hands one after another. He has to win the previous game in order to play the next one. If he does so then the next game is played at doubled payouts. 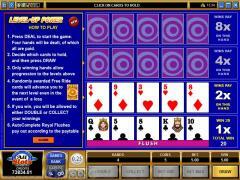 All four hands are dealt at the start on the right side of the screen and the cards of the first hand are turned face up. On the left side of the screen the players can choose the number of coins from one to five and the corresponding payout table for single payouts is displayed. At the bottom right are the buttons that the player uses to operate the game. The player can use the Bet Max button to wager five coins. At the extreme right is the Deal button used for dealing the cards. Double Joker is a video poker variant played with a deck of 54 cards, the additional two cards being jokers. The jokers are wild cards, which can replace any other cards in order to make a winning combination. Because the game uses two jokers the payout table begins with Two Pairs instead of the usual jacks or better. Other special winning combinations that arise because of the jokers are Five of a Kind and Joker Royal Flush. The wager for all four hands is paid upfront. The player plays the first hand in the usual way. If he fails to draw a winning combination then the game is over and the player loses his entire wager. If he draws a winning combination then he receives the appropriate payout and the second hand is exposed. After playing the second hand if the player loses then he has the option to double or collect his first hand winnings. If he wins in the second hand he receives a payout twice that in the payout table and gets to play the third hand. The play then proceeds in a similar manner. 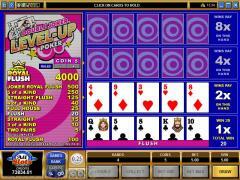 Double Joker Level Up Poker has two special features not available in normal video poker games. One is the Free Ride Card. If this card is displayed during any deal then the player can play the next hand even if he does not draw a winning combination. However there will be no payouts for that hand. The second feature is the Auto Complete Royal Flush. 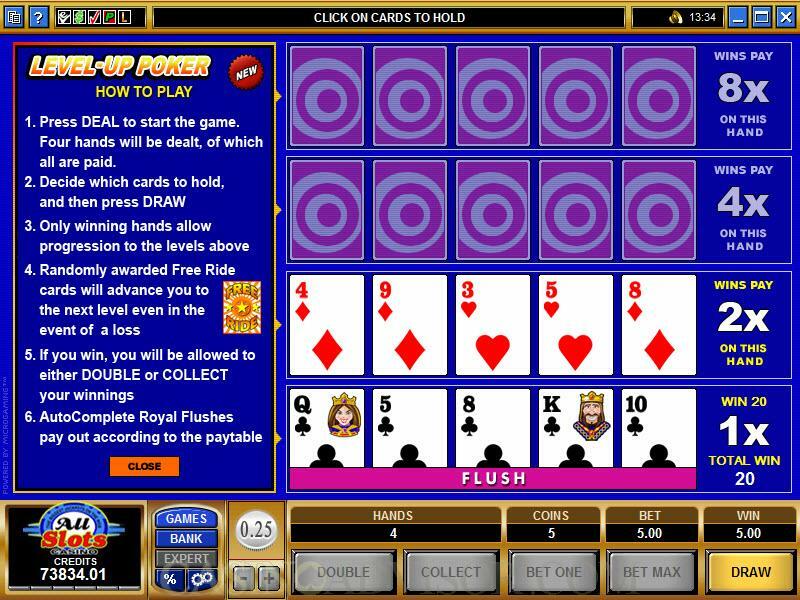 If the player loses before playing all four hands then the remaining hands are exposed and if any of them contain a Royal Flush then the player gets a special payout. In the Double feature the player is dealt one card face up and four cards face down. The player picks a face down card and if it is greater than the face up card then the winnings are doubled. Interested in reading more detailed information about Double Joker Poker? If so Click Here for more details.